When someone is as obsessed with controlling the narrative as Julian Assange is, it’s almost to be expected that they would view a cuddly pile of fluff as a means of propagandizing. 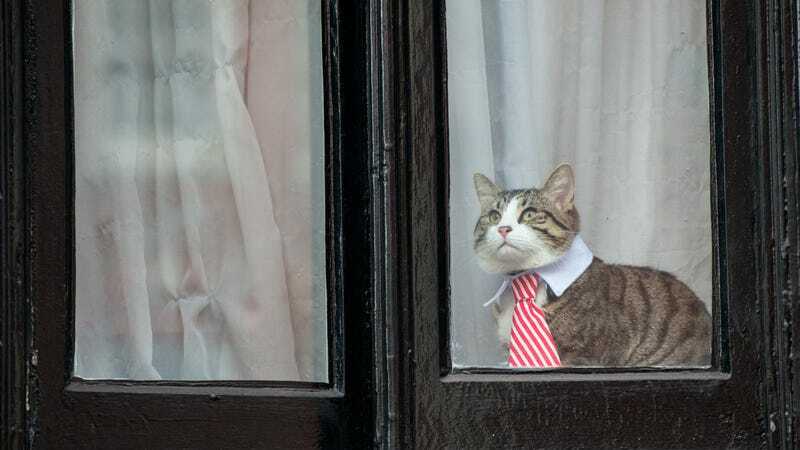 Such was the destiny of Embassy Cat. It seems that the only endearing thing still in Assange’s sphere of influence was initially regarded a tool of public deception. Assange has been holed up in the Ecuadorian embassy in London since he was granted asylum in 2012, hoping to evade extradition to Sweden for sexual assault allegations (which have since been dropped). The profile contains a number of other interesting details about Assange’s time confined within the embassy, including an anecdote about his arrival and the measures he was ready to take to avoid relocation. Assange told me that, preparing for imminent arrest, he readied a pair of handcuffs so that he could physically secure himself to the Ecuadorian consul. While sadly lacking further details about Wikileaks’ feline ally, you can read the whole thing (and more predictably megalomaniacal quotes from Assange) here.